Numbers are the nub of many presentations, yet the challenge is not to numb but inspire, nourish and nurture our ideas with numbers. One way to do this is by adding an interesting fact, or sharing a customer observation, after the number. A presenter at a large conference started by saying: One in three people will suffer from public speaking anxiety in their lifetime. Turn to the person on your right, and then to the person on your left, among the three of you, who will it be? Everybody laughed, but the stat sunk in. Another way of presenting stats is to quote an authority or expert in the area. You could say, for example,‘I was reading Seth Godin’s blog and he shares that one of the top 100 things searched for on Yahoo! is Yahoo’. No matter how boring the numbers are there are many imaginative ways to present them. At a recent conference the CEO presented his numbers as a weather map of the regions. It was the highlight of the conference. Hans Rosling’s TED Talk The best stats you will ever see is an example of how you can do numbers well, even with a serious topic. Rosling presents complex, longitudinal, global stats on child mortality, but does it with drama, urgency and adopts the persona of a sports broadcaster. It’s magic and it works without minimising the seriousness of the issue he is dealing with. As the presenter, you have to make strategic choices about the data you are going to show. And then think how can I inspire people with these numbers? I saw a children’s movie recently and came away – somewhat surprisingly – with a fantastic business hack. Big Hero 6, an action-packed comedy-adventure movie, features Baymax, a plus-sized robotic health care companion, and 14-year-old protagonist Hiro. It’s a lot funnier in the film and, of course, in a swashbuckling adventure, good triumphs over evil. But Baymax echoes a cosmic question: How does this impact my identity and who I am? This is much deeper and richer than the standard WIIFM (what’s in it for me), which might cause us to reel out a string of benefits. It’s so much easier to wade in the shallows with a dim view of our audience, than to think about or articulate what really matters. How this will impact their identity, their very being? In their brilliant best seller Selfish, Scared and Stupid, behavioural strategists Gregory and Flanagan say whether you’re seeking to sell more product, shift perceptions and drive social change, or if you’re driven to lift the performance of your team or to inspire yourself to do more, you must first understand what drives behaviour. And nothing drives behaviour more than identity: who I see myself as, what I want the world to see me as, and what I aspire to be seen as. So the next time, start by asking yourself: How will this help my audience be a better (insert their identity here). It might be a better leader, better teacher, or better entrepreneur for example. And design your message from the identity out, for maximum impact. It was an early-morning flight to Brisbane. The severe storms in Sydney meant delays, long queues and grumpy passengers. The crew came around offering coffee and tea. The man next to me, with a smile and cheeky glint, said “Any Champagne, please?” The hostess replied, laughing: “It’s a bit early for the C word!” They bantered back and forth and soon everyone around them was. She returned shortly after and pressed a bottle of Champagne into his hands and he was delighted. Ahh – it does pay to be charming! Nobody knows this more than Linda Kaplan Thaler and Robin Koval, who work in one of the toughest industries: advertising. They share their success secrets in their New York Times bestseller The Power of Nice. Kaplan and Thaler believe our culture propagates social Darwinism: a ‘me versus you’ mentality. They moved to the top of the industry by behaving contrary to conventional wisdom: by being nice. They have, over a decade, built up the Kaplan Thaler Group to one billion in billings, using chocolates and flowers rather than pitchforks and spears. It’s a simple yet powerful philosophy. They also agree ‘nice’ has an image problem. Nice gets no respect. Kaplan and Thaler convincingly argue, however, that nice is the toughest four-letter word you can use in business, as it means moving forward with clear-eyed confidence when you place other peoples’ needs equal to your own. What is your experience? Do nice people finish first? A torched pharmacy, burned down by rioters, forms the backdrop. 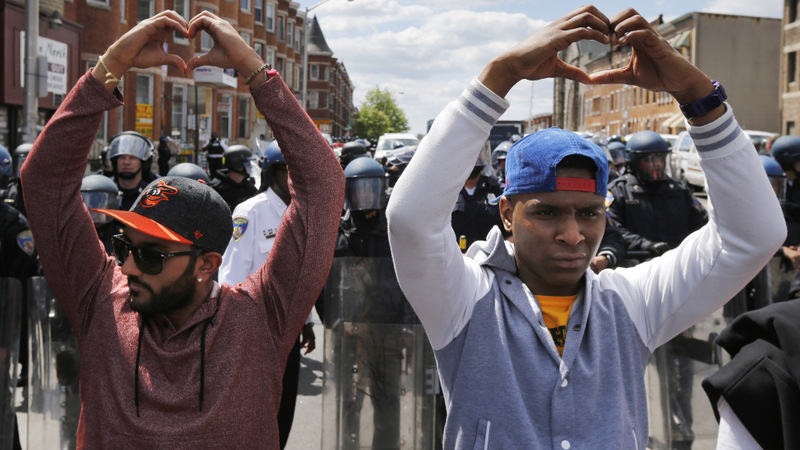 April 2015, Baltimore USA: a city on fire. After days of riots, a peaceful protest turns ugly as a bottle is thrown at the police. The advancing line of policemen launches pepper spray in retaliation. The media converges knowing this is going to turn ugly, fast. Suddenly, a line of African-American men moves forward, placing themselves between the police and the protestors. They raise their hands over their heads. Are they surrendering? They then touch the tips of their index fingers and thumbs, creating a love-heart shape, held above their heads. The police freeze and the protestors back off. Nobody is willing to launch an assault. What diffused this ticking time bomb? Love did. Way back in the 15th century Machiavelli said it was better to be feared than to be loved. But is it? Is that what you want, as a leader? Today the pendulum has swung the other way. The world’s strongest power is not fear; it is love. When we talk about love as an influence tool at work, we are talking about love for what we do (passion), love for the people we do it with (companionate love) and love for the people we do it for (our customers). On Thursday last week, one row of ordinary citizens changed history with the best four-letter word in the world: L-O-V-E. Please comment I would love to hear your thoughts.